Introduction: The Master Blaster of Indian cricket, Sachin Tendulkar, is facing identity crisis. The cool Pepsi felt hot and scalding to Sachin when Pepsi decided to drop Sachin as its brand ambassador by not renewing their contract. with him. Fiat, Airtel and TVS have also dropped the 35­ year­ old batsman as their brand ambassador. Currently Sachin is passing through Sukra Antardasha in Rahu Mahadasha, since June 26, 2008. Sukra as the Lord of his Second house of wealth and as the Lord of his Ninth house of Bhagya and luck is placed in the Eighth house of evil and is combust, though vide a separating conjcuntion. 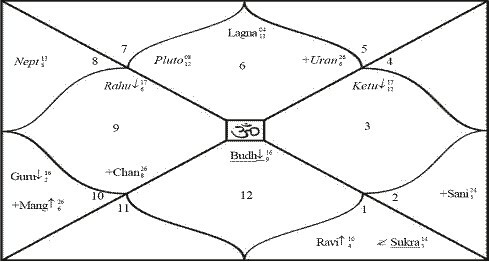 It is thus weak in his chart, indicating that he may face obstacles in earning money and influencing people in Mahadasha Antardasha. Look at the applying trine aspect of Rahu to natal Sukra. Rahu, as such, is afflicted and evil as it is debilitated and its aspect of a weak Sukra indicates tough times with regard to charm, glamour, virility, money. Luck may come up in the Rahu Mahadasha Antardasha when there is Sukra Antardasha or Mahadasha in force at the time. Another malefic factor is that Guru is a Badhak planet for him and currently it is passing through his Fourth house and is swagruhi there in becoming more powerful as a Badhak planet. This Guru has been aspecting his natal Sukra since December 2007. The stage for his current loss of advertisement revenues had been set there and it was supported by the Ketu Antardasha in force, from June 2007 to June 2008. As mentioned earlier in the article of Mr. Tanmay Thakar, during the Budha Antardasha, due to various reasons, he could not perform well and could not maintain his status. That led people to believe, in his Ketu Antardasha, that he would no be able to pull crowds. All the above factors started gaining strength and while Guru started aspecting his natal Sukra the beliefs that Sachin may no be the Master Seller became crystal clear. Now the master brand Pepsi has pulled the cord when his Sukra Antardasha has come into force. So now what will happen to Sachin? Well, since this is about his financial aspects, so Ganesha will not comment on his play and performance on field. Look at the length the Sukra Mahadasha that Sachin will go through. It has just begun and will last till June 2011. That’s three long years, three years of financial constraints, three years of not being able to throw and cast his charm and spell as the Master Seller. It’s definitely going to be tough on his abilities and possibilities of getting ad revenues out of any kind of glamourous appearances. The extra and large bucks may elude him for at least three years and he may start feeling the pinch. What should Sachin do to avert this eventuality which seems to stare in the face? Well, Ganesha feels that he should first and primarily appease Rahu, by offering his prayers and puja at Kaal Hasthi near Tirupati Balaji. Strengthening Sukra is required by adorning a best quality diamond. This will definitely help him in his efforts to maximize his other incomes. Wishing Sachin a very good monetary future.